First, a couple of housekeeping notes. On Sunday, I'll be making two appearances in the Chicago area. The first is in the western suburbs, at Centuries & Sleuths in Forest Park at 11 AM. I will be there as part of C&S's 20th Anniversary celebration along with fellow outfitters Bryan Gruley and Barb D'Amato, as well as Theresa Schwegel, and D.C. Brod. Then at 2 PM I show up on the South Side at the Beverly Arts Center as part of their Author Afternoons series. If you're available I would love to see you at either event. 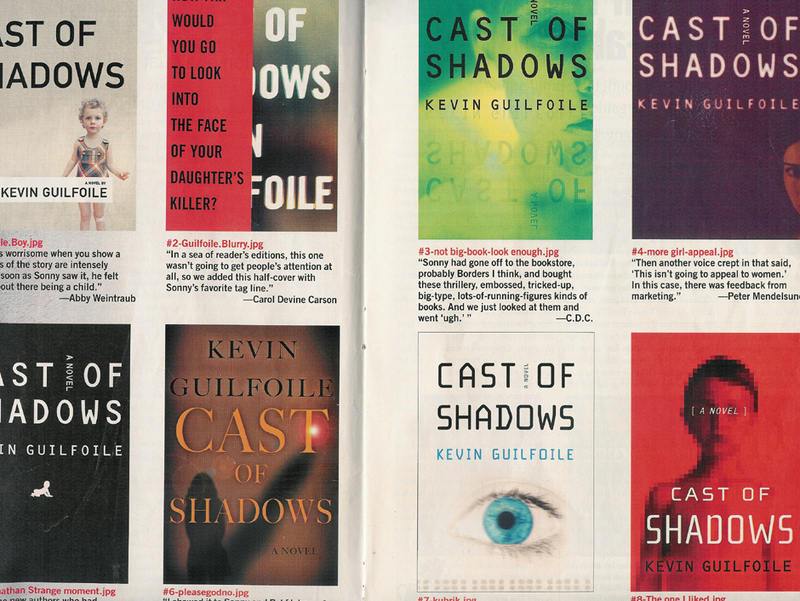 In the months before Cast of Shadows was published, the cover changed many, many times, almost none of them having anything to do with me. This happens all the time and the reasons are complicated and probably not all that interesting. 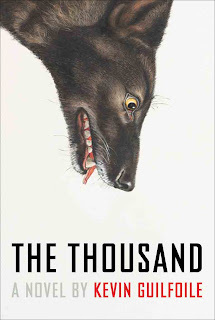 But I do know that the cover changed an unusual number of times because Publishers Weekly actually did a big story about the unusual number of times the cover changed. 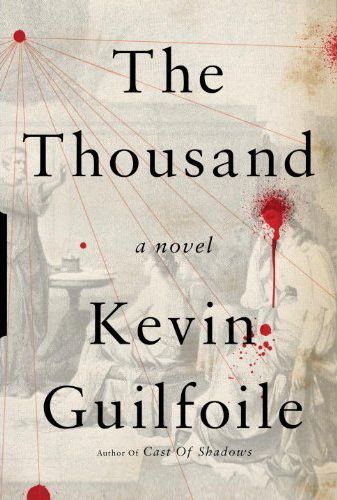 When I got the email with a subject line promising a peek at the cover art for The Thousand, I was apprehensive. If I didn't like it I was reluctant to start a second war over one of my dust jackets. So I was relieved when I opened the attachment and loved, loved, LOVED the cover. I think I actually did a little dance, and if you were at my wedding that has probably created an unpleasant mental picture. Anyway this is the cover that made me dance. An aside: When a publisher is desperately trying to get you to approve a cover, your name tends to get very large. We finally ended up with the cover you see in bookstores, and none of this should be interpreted to mean that I don't like that jacket. I do. And in my informal surveying of readers and booksellers, a majority prefer the Pythagoras cover to the Wolf cover. The only reason I bring it up is that it's amazing to me that two jackets with such different sensibilities could both work so well (according to me) for the same book. And yet I bet if we had gone with the wolf cover, readers would have a very different expectation of the novel than they do now. It's impossible to know how it might have affected their enjoyment of the book (for better or worse), but it's fun to wonder about. Certainly all the things we know (and assume) in advance about a novel--story, characters, genre, voice--have some sort of impact on how we respond to it. I'm interested to know, whether you've read The Thousand or not, how your impressions of the book change when you consider one cover or the other. And if you're an author, give your book designer some love. It's an impossible job in which you have to please a hundred people who never agree, and the only time you ever hear from an author is when he's belly-aching. I like the wolf cover much better. Very visually striking. I'm with Pete on this. The wolf is eye-catching. After a second or two it became puzzling, which is important in pulling a reader over to pick up the book. I like the Pythagoras cover. Not sure why. Not as stark, maybe. More mysterious. Dana the real CoS hardcover was red foil with a blurry image of a child on it. 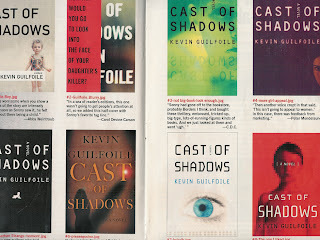 Those covers you see in the PW article were all designs that didn't make it. Yep. That's the one I got. You/they chose wisely. I think it was the best of the selections. Thank you for posting this - very interesting to see a cover that was discarded next to the one that made the cut and is lying in bookshops now. As a graphic designer I would pick up the wolf cover immediately. It is much more intriguing, edgy, less cluttered, and powerful than the other cover. It has a distinct character, and that could be the reason why it was shelved. A potential reader/buyer might not immediately get what the book is about, something publishers don't like much. The cover of THE DA VINCI CODE is a nice example of a design that has served as a prime source of 'inspiration' for many fiction covers since. The reason why is pretty obvious, but I'm sure that choosing something safe and tested doesn't necessarily do justice to the author, the novel, or the reader. Below is a link that also shows two book covers for the same title, and the reason why the top one was chosen for publication. Does a Series Character Have To Grow?